Blog support lets users create, edit, and delete blog posts. In addition, role-based permissions let you restrict blog actions to specific user types. Forums let users create threaded discussions with role-based moderation. 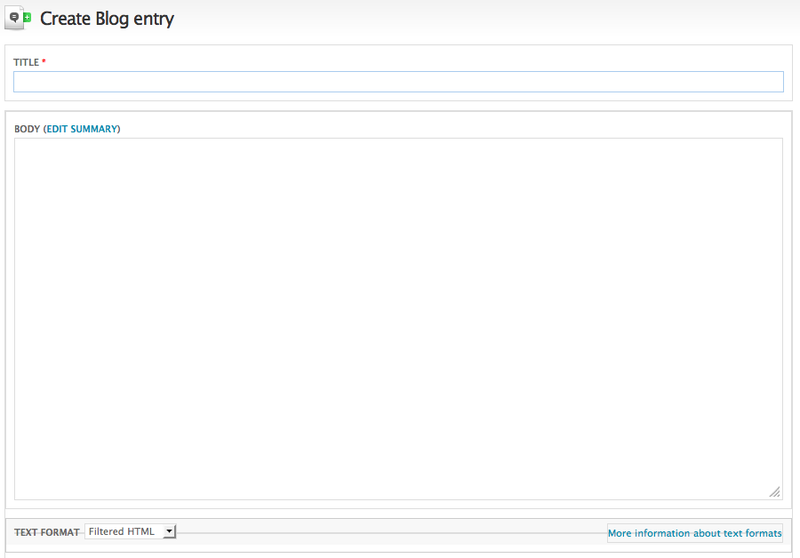 You can add forums to the portal, group forums in a hierarchy, and configure user roles to control access to the forums. The portal lets users with the necessary privileges create, edit, and delete blog posts. Blogs are made up of individual posts, which are time stamped and are viewed by date. Anyone, including anonymous users, can view the most recent blog entries by using the navigation link provided on the portal Home page. Any user with the necessary privilege can comment on a blog post. Comments can appear as soon as they are entered, or you can configure the developer portal so that comments must be moderated before appearing. By default, anonymous users cannot post comments. The standard blog as implemented by the Drupal Blog module is used by default by releases of the portal previous to version 14.02.156.1. The Apigee custom blog with a custom view of posts, support for the image, audio and video content types, and a "tumblr-style" editing toolbar as implemented by custom Apigee Drupal modules. Version 14.02.156.1 and later of the portal use the Apigee custom blog by default. Existing portals can be upgraded to use the new blog as part of upgrading to version 14.02.156.1. Note: Many of the steps that you use to configure the blog are the same for both versions. Devconnect Blog Defines the basic functionality of the blog. Devconnct Content Creation Menu Defines the menu that lets you create different types of blog content. devconnect blog content types Defines the Drupal special content types for the blog: image, audio, and video. Without this module, you can only create blog entries of type article. If you want to use the custom blog, ensure that your version is 14.02.156.1 or later. Ensure that your portal has been upgraded to version 14.02.156.1 or later. Select Modules in the Drupal menu. The developer portal displays recent blog posts on the Blog page. The blog entries are displayed in descending order by creation time. 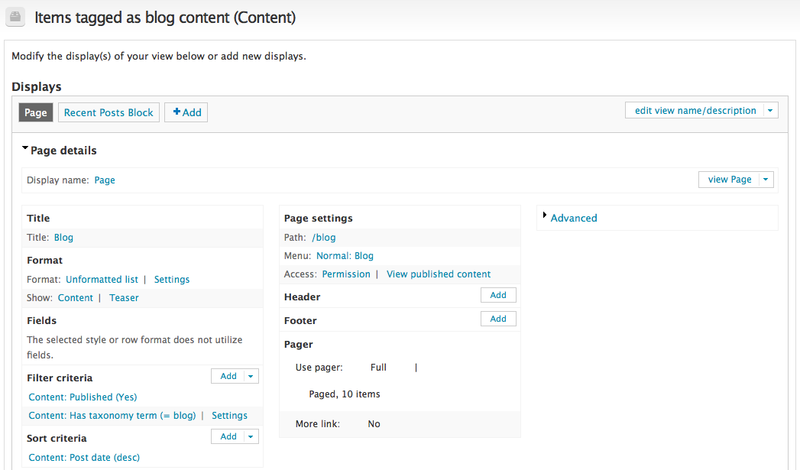 To display the Blog page, select Blog in the developer portal main menu. In addition, the developer portal is initially set up to display recent blog posts on the Home page. The entries are also displayed in descending order by creation time. As an administrator, you control the permissions required to perform actions on the blog, such as creating, editing, and deleting blog posts. You also configure the permissions required to post, edit, and delete blog comments and whether a user's comment has to be moderated. If a comment does not have to be moderated, it appears immediately. If the comment has to be moderated, a portal user with the necessary permission to moderate comments must approve it. Select People in the Drupal menu. Select the Permissions link at the top of the People page. Scroll down to the Comment area of the page. Scroll down to the Node area of the page. All users with the necessary permissions can create a blog entry. However, you can configure user roles such that a user can add and edit their own blog entry, but not delete it. Or they can add, edit, and delete their own blog entry, but not edit blog entries from other users. The buttons on the lower right let you add content defined by the Bootstrap project, including a carousel, featurette, jumbotron, and trifold. The lower area lets you add the associated media. 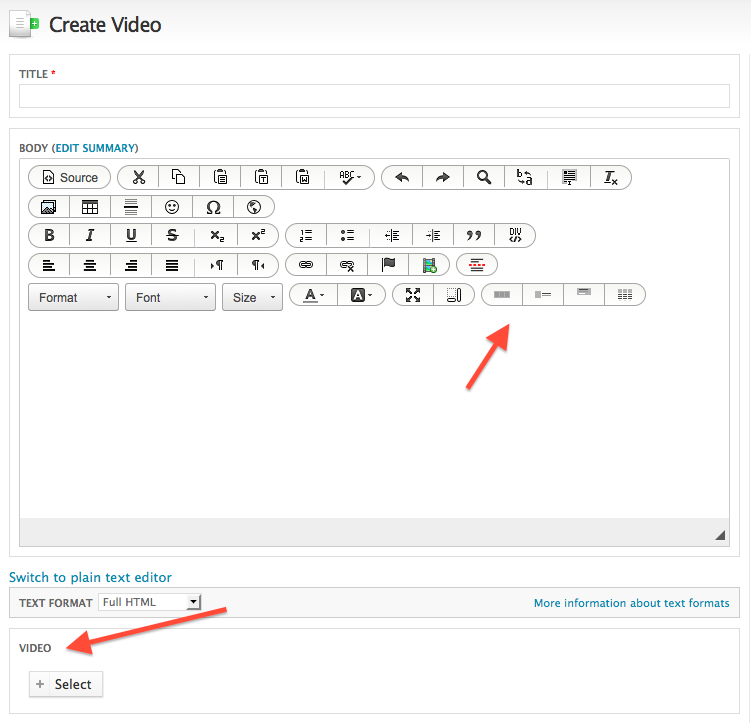 For example, in the figure above for the video content type, you can add a video to the blog entry. 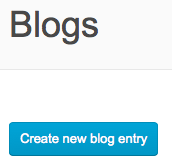 Select Blog in the developer portal navigation menu. Select Create new blog entry (Drupal Blog module) or the content type (Apigee custom blog). Add content in the Title and Body sections. If applicable, click Edit summary to add a summary. Enter a comma-separated list of keywords. These key words are used to populate the Hot Topics view on the Blog page. You can optionally add the Hot Topics view to the Home page, or to any other page. Depending on the type of Blog entry, you might have to expand the Meta tags area of the page to enter keywords. The blog is published to the blog's front page and is listed on the Home page in the Recent Blog Posts area. When you create a new blog entry, the Blog module records basic information about the content, including the author ID, date of creation, and content type. Users of the developer portal can post comments to blog entries. By default, a user has to be logged in to the portal to post a comment. A users ability to view, post, edit, and approve comments depends on their role and permissions as described above. Log in to your portal as a user with admin or comment approval privileges. Select Content > Comments in the Drupal administration menu. Select either the Published comments link or the Unapproved comments link. Use that page to moderate comments. The developer portal uses a Drupal view, called the Items tagged as blog content view, to control the display of blog entries on the Blog page. By default, blog entries are listed in descending order of creation date. Select Structure > Views in the Drupal administration menu. The developer portal uses a Drupal view, called Hot Topics, to control the Hot Topic display for blog entries on the Blog page. By default, Hot Topic items correspond to the keywords added to blog posts. Note: In releases of the portal previous to version 14.04.16, the Home page displayed the Hot Topics view by default. That view was replaced by the SmartDocs view in release 14.04.16. The Home page for the default Apigee theme only allows you to display three views. If you want to add the Hot Topics view back to the Home page, you must remove one of the existing views. Select the Edit link in the row for the Hot Topics (Content) view. This displays the page that you can use to configure the view. Forums let users with the necessary privileges create threaded discussions with functionality similar to other message board systems. A topic is contained within a forum, and each forum can hold many topics. Topics can also have their own URLs. Users post new topics to a forum. Each forum topic is comprised of an initial post, plus replies or comments. Depending on the user's privileges, the user can edit and delete their own posts, and edit and delete the posts of other users. By default, anonymous users can view posts but cannot post replies. Only authenticated users with the necessary privilege can reply to a post. Replies appear as soon as they are entered, meaning they are not moderated. Administrators set the permissions required to post, to edit existing posts, and to delete posts. Administrators can also promote forum posts to the Forum Discussions area of the Home page. The Drupal Forum module is the core forum module and is used by default by releases of the portal previous to version 14.02.156.1. The Drupal Advanced Forum module enhances the core Forum module to add additional features including improved styling, quick search for active topics, unanswered topics, new topics, and more. Version 14.02.156.1 and later of the portal use Drupal Advance Forum module by default. Note: Most of the steps that you use to configure the forums is the same for both the Forum and Advanced Forum modules. Enter "forum" in the filter list at the top of the Modules page. If the Advanced Forum module is listed and is enabled, then you are using the Advanced Forum module. If Advanced Forum module is missing or disabled, and the Forum module is enabled, then you are using the core Forum module. The Advanced Forum module has configuration settings that control forum display, breadcrumbs, and other visual characteristics of the forums. Note: These settings are not available in the core Forum module. Select Configuration > Content authoring > Advanced Forum in the Drupal menu. The Advanced Forum page appears. As an administrator, you control the permissions required to perform actions on the forums. You set permissions used by both the Advanced Forums and Forums module, and set permissions specific for each module. If you are using the Advanced Forums module, scroll down down to the Advanced Forums area and set the associated permissions. If you are using the Forums module, scroll down down to the Forums area and set the associated permissions. By default, the developer portal comes with a single forum called General discussion. You can add additional forums, nest forums, and create forum containers which are groups of forums. A forum container gives you a way to create a collection of forums. However a container is not a forum itself, it simply defines a collection of forums. Select Structure > Forums in the Drupal menu to see the list of current forums. On this page, you can edit existing forums or rearrange the order that forums appear on the Forums page. Add information about the new forum, including its parent if you want to nest the forum. Click and drag the plus sign, +, before a forum name to change its order or nesting level. Add information about the new container, including its parent if you want to nest it. On the Forums page, click and drag the plus sign, +, before a forum name to add it to your new container. The default Home page contains a Drupal View that controls the content of the Forum Discussions area of the Home page. In order for a forum topic to appear in the Forum Discussions area, an administrator has to promote the topic. Filter the content by selecting Forum topic in the Type dropdown box, and then selecting Apply. Only Forum topics appear in the content list. Select one or more forum topics to promote. In the Operations dropdown, select Promote to front page. All selected topics now appear in the Forum Discussions area of the Home page. Alternatively, you can edit an individual forum post and select Promote to front page in the Publishing options for the topic.